* Mac users: to watch this VR video in 360 degrees, please use Google’s Chrome web browser. Home to 19 million people, Greater Los Angeles is also nature, and home to a wide range of animals – among these the majestic mountain lions, who live literally minutes away from LA landmarks like the Hollywood sign. The #SaveLACougars campaign, led by the National Wildlife Federation in collaboration with its many partners, focuses on building the wildlife crossing at Liberty Canyon. Spanning ten panes of pavement over the 101 freeway, this crossing will reconnect an ecosystem and re-enable natural migration and travel patterns for wildlife. The wildlife crossing will blend seamlessly into the surrounding landscape, enabling mountain lions and other animals to safely cross the dangerous 101 freeway and reunite with their kind – safeguarding healthy, sustainable wildlife populations. Virtual Reality transports viewers to another place – just like they’re actually there. It enables us to tell the story of the mountain lions in a whole new way – taking the viewers along on a journey from the wilderness of the Santa Monica Mountains to the dangerous LA traffic. 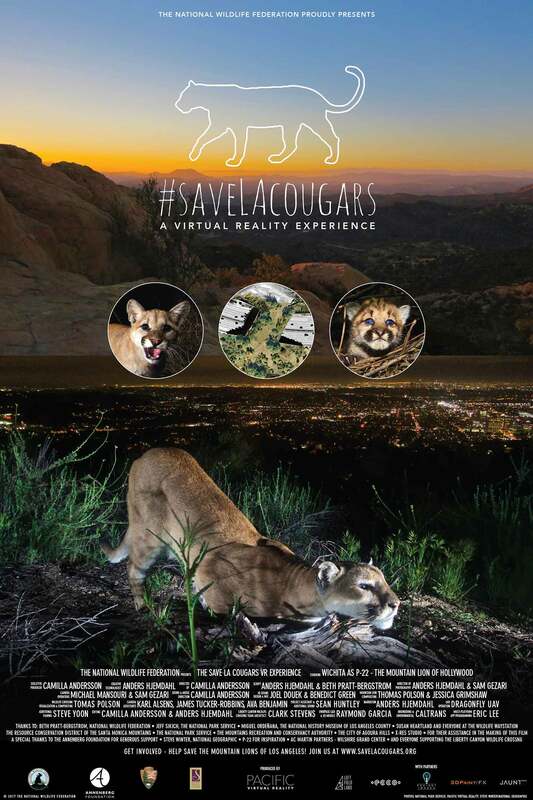 The Save LA Cougars VR experience takes you through contrasting scenes – from standing on the tallest building in Los Angeles, to flying over Liberty Canyon, encountering a live mountain lion, and seeing the wildlife crossing as it gets built in the near future. GET INVOLVED – HELP BUILD THE WILDLIFE CROSSING! When built, the Liberty Canyon Wildlife Crossing it will be the largest such crossing in the world, and a model for urban wildlife conservation – enabling us to live together with our wild neighbors in a better balance. Get involved and help build the wildlife crossing! visit the Save LA Cougars web site. THE MOST FELINE WAY TO EXPERIENCE VR!